Even though you believe that it is a good thing that clotheslines laden with wash drying in the sun is good to remain in the past, apparently, automated clothes dryers opened another issue, as despite being convenient, it brought numerous chemicals in our surrounding with it. First of all, the use of softeners became a must, as machine washing and drying made the clothes quite rough. Moreover, machine-dried clothes stick to each other, so we now need to use anti-static dryer sheet as well. In this way, clothes we wear include numerous chemicals which come to direct contact with the skin. We aim to remove dirt and grain, and we add far more dangerous ingredients. 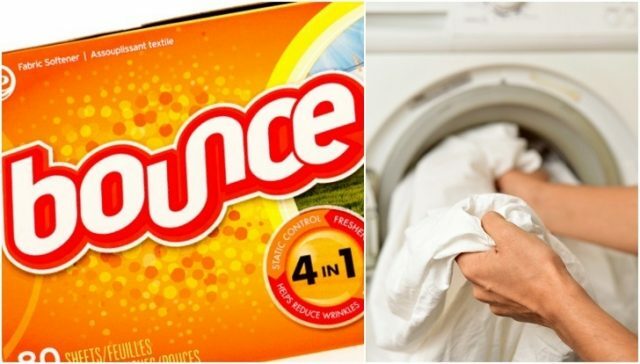 As soon as dryer sheets became to be used, the use of liquid fabric softeners arose, which are full of ammonium compounds, particularly distearyl dimethyl ammonium chloride, which was later replaced with other chemical compounds. Dryer sheets were intended to reduce the buildup of static electricity, but they were found to be better at distributing a thin layer of fabric softeners all over the clothes, and people simply add the liquid softener during the process of washing the laundry. For an enhanced experience, even incredible fragrances were added. When the laundry washing includes clothes of different materials, their continued rubbing knocks off electrons, and some clothes become positively charged while others carry a negative charge. This is the reason why they stick together, as the opposite charges naturally attract. Dryer sheets are impregnated with positively charged cationic chemicals, which neutralize the particles with the negative charging of the clothes, and thus eliminate the basic cause of static buildup. The activity of fabric softeners is similar to the one of the cationic antistatic chemicals, as they have such a charge that makes the fabric fibers to stand up, leading to a soft, velvety feel. In the case of cationic chemicals, the fabric is also made non-static. The deposits on the clothes by the chemicals of the dryer sheets help to avoid piling and wrinkles, so ironing is not necessary. Moreover, even if you iron, it goes smoothly, due to the waxy coating. Even though clean fabrics have no smell, we somehow associate certain odors with cleanliness and freshness. Dryer sheets come in various fragrances which enhance the effects of the clean clothing. Numerous detergents and fabric softeners may lead to skin irritation or allergic dermatitis, and these issues are treated as soon as the person changes the brand of the product. Also, the body may become sensitized after repeated exposures. Additionally, allergic dermatitis is another serious health threat by dryer sheets. Allergic dermatitis is just one of their many hazards of dryer sheet, and asthma and respiratory allergies may often result from the toxic substances in these sheets, which released into the indoor air from the laundered bed linen and towels. A great part of the chemicals used are carcinogens, and as they deposit in tissues, they can cause malignancies. These chemicals may also lead to disorders of the nervous system, as well as memory loss, irritability, loss of coordination, confusion. Chloroform – This chemical is an anesthetic that has gone out of use because of its toxicity and fatal outcomes, but unfortunately, it is still used in the industry. It is used in dryer sheets due to its capacity for hydrogen bonding. Chloroform is quickly absorbed through the skin, airways, mouth, and leads to skin sores, respiratory depression, central nervous system, eye irritation, etc. Ethyl acetate – It softens the clothes, but even though it is believed to be safe, if in concentrations above 400ppm, it irritates the eyes, throat, nasal passages, and causes skin eruptions. Benzyl acetate – This organic compound has an incredible fragrance, and it is combustible below the boiling point of water. The exposure to this compound leads to confusion, dizziness, dry skin, drowsiness, red eyes, and inhaling its vapors can cause labored breathing, a burning sensation in the airways and a sore throat. When people work with it, they are advised to use goggles, gloves, protective clothes, and to wash the contaminated clothes with water and soap. And yet, this same compound is used in laundry. Dichlorobenzene – This industrial chemical is often used in pesticides. It is commonly electrophilic, so it attracts electrons, so it is great as an anti-static agent in fabric conditioners. Yet, its exposure leads to irritations of the skin, throat and eyes, and long-term exposure affects the kidneys, liver, and central nervous system. It is considered to be a possible human carcinogen by ETA, as it has been shown to lead to liver and kidney tumors in mice. Camphor – This chemical is derived from pine oil, and it has a popular insect repellant property. moth balls, and as a food flavoring agent, but its use has been discouraged since 1980 by the FDA. Even in small doses, it suppresses appetite, breathing, and increases heart rate. In larger doses, it leads to vomiting, irritability, lethargy, stomach cramps, disorientation, as well as seizures and convulsions. Dryer sheets also include alpha pinene, alpha terpineol, linalool, and limonene, which are aromatic compounds naturally found in numerous essential oils. Yet, the synthetic versions are more often used, and the constant exposure to these may lead to nervous system disorders, such as depression. White vinegar is safe for use, even for small baby clothes. It has been traditionally used for rinsing cloth nappies to prevent nappy rashes. It eliminates detergent residues and removes the stiffness out of dried clothes. It also eliminates static, as well as mildew. You should add ¼ cup vinegar in the rinse cycle. You will reduce static build up if you dry the clothes at a lower temperature. Another trick is to take the laundry out while damp a bit and then leave it to air dry. To prevent wrinkles, shake the clothes out before hanging. Baking soda is a natural deodorizer, so you should add 3 tablespoons of it during the wash cycle, and you will remove detergent residue and soften the clothes. Reusable chemical free dryer cloths can be with or without natural fragrances, or you can make your own by wringing out a washcloth in vinegar. For a better smell, add a drop of some essential oil. The metal strongly attracts the electric charge and helps discharge it, so you should run the hanger from top to bottom. There may be a need to straighten out the wire hanger to fit inside narrow sleeves and legs. Natural fibers like linen, cotton, and wool, are a healthier alternative to synthetic fibers, even the latter are easy-care materials. They are good for the skin and do not cause the side effects of chemical additives. Dryer balls keep the clothes soft, reduce static, are reusable, and do not contain chemicals. As soon as you place few highly absorbent dryer balls with the wash load, they absorb the moisture from clothes and dry them quickly. On the other hand, they also release some moisture, to keep them slightly humid, and thus reduce static. As the move during the cycle, they also reduce contact between materials and thus lower the buildup of electrical charges. If possible, try to make your own dryer balls, from wool roving to tennis-ball sized balls, tied with poor wool yarn. Use inexpensive nylon netting or old pantyhose to stuff them, and run them through hot wash cycle once or twice. Then, remove the netting and start using them.